Intel is just rotten to the core. Like others, I am wondering if Zen is affected. That is very odd and glaringly so, Did they open sauce the tools for testing? 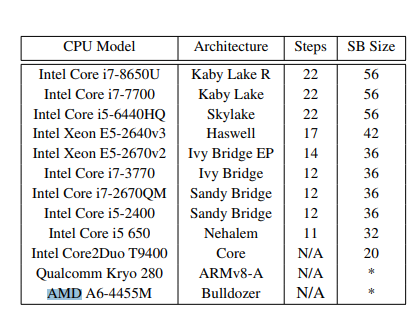 Most of the critical Spectre/Meltdown issues only affect Intel though AMD is not completely immune but this is derived from the Intel based Spectre flaws that some engineers had warned Intel about 20 years ago. From what little I've seen, most of AMD x64 designs have not suffered the critical problems simply due to them following "Best Practices" in their design. Intel's Engineers need to have their licenses revoked for critical flaw and not following "Best Practices". As to Zen being affected, AFAIK it's minimally affected by Spectre and mostly immune to Meltdown (ymmv). Not sure why they only tested the one. Could possibly be initially only tested one then found a flaw and decided to test more of that brand. Not sure how they do business, I do know that people think like that. I'm thinking they tested on all computers they had around in the office and at home. And those were all Intel besides one crappy laptop with AMD. It could simply be that whenever they were buying a computer, they always bought Intel and they never bought AMD. The CPUs from AMD released after Phenom and before Ryzen, so from 2011 to 2018 or so, were not exactly attractive choices. It's not strange that they ended up with Intel in every single one of their computers. That one AMD CPU in the list seems to be something that's used in crappy $300 laptops? Thats because it's based on speculative execution. AMD didn't invest heavily into it, that's why some of their arch's like Thuban aren't affected while the cpu's that do speculative execution are. TL;DL Intel took many liberties to gain the performance crown and now it's nipping them in the bud. Seems to me like all this stuff is still pretty "Much Ado About Nothing", at least for the average individual PC owner. Obviously data centers, businesses, etc will have a LOT to worry about when it comes to any sort of security vulnerabilities, but the reality of it is that the average user here on OCN is not bloody likely to be targeted by any hackers in the first place simply because we are just not that important to anyone. While its obvious that any security vulnerability like this is not good news, you have to remember that there are hundreds of millions of people in the world using Intel machines so the odds of anyone individually targeting YOU remains statistically insignificant, from a big-picture point of view. Obviously if you are a huge corporation or someone of importance / notoriety (celebrities, politicians, popular internet personalities, etc) then you are already an easily identifiable target for an attack, but the vast majority of us remain safely unknown to the bad guys because of sheer numbers, not to mention the lack of motivation to target any of us. For instance, if some hacker wanted access to my bank account, all their efforts in gaining access to my system would net them is, oh, about $87.94 at the moment! You have to think bigger. It's not about what you might have in your bank account, think "identity theft". If you have really good credit, I'd be better off getting a few credit cards in your name and running up tens of thousands of dollars. The only thing the CC company would have is your information. You're going to have to spend time and money trying to prove you didn't actually make those purchases. That's the kind of thinking that leaves big gaping holes in the cache. It's not about our Intel chips, it's about all Intel chips. You're a single (normal?) person, (someone) could drive (a single fictional person) $5000 into debt before tapping them out assuming they don't have the best credit. That's their one machine compromised. I'm not skilled enough to do this over networks but if possible to do, you'd only need one terminal on a network to gain root access to all of them. Maybe not instantly but it could be done, you'd be amazed what you can do with Kali. Look at what's possible with the slightest vulnerability in software...now apply that to an unchangable piece of silicon that could be around for YEARS and it affects GENERATIONS of chips used by the hundreds and even thousands in offices, homes and far beyond.